When I learned that the government had banned the grizzly bear hunt, I was too stunned for words. I couldn’t help but recall some distant skirmish 20-25 years ago with entrenched politicians and the king’s advisors. This battleground for the grizzly bears has been one of the longest and dirtiest political environmental campaigns I have ever witnessed in BC, not the least due to pro-hunting, entrenched government biologists attempting to discredit or ignore any biologist who spoke out and documented that management of the hunt was not scientifically credible. To be honest, I thought I would never see the end of the grizzly bear hunt. When I began my career as a young biologist with the Canadian Wildlife Service, I knew that grizzly bears had disappeared from a large percentage of their range in North America, and that the same relentless forces that had caused that — human population spread and exploitation of resources for profit, regardless of the consequences on wildlife — were at work in BC. I pursued my studies in the field, often in the fringe areas between growing human influence and pristine wilderness. My work took me to parks that were losing grizzly bears due to encroaching development both outside and inside park boundaries, and to areas where the Granby Grizzly and the Chilcotin Grizzly, unique dryland grizzly bear populations, were losing ground and in need of recovery. One government study predicted that if we did nothing, grizzly bears would be largely gone from BC by 2050. I agree with the recent Auditor General’s 2017 report that habitat loss is the greatest threat to BC’s grizzly bears, but human-caused mortalities from all sources are cumulative, and they include habitat loss, hunting, poaching, human conflicts and highway accidents. Over the years, independent scientists told the government repeatedly that it either had to protect far more habitat or stop the hunting, or BC would lose its grizzly bears. The habitat destruction has not slowed down. 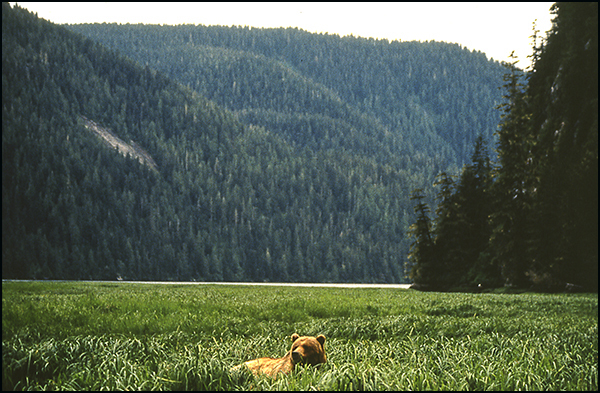 Thirty years ago, while working to save the Khutzeymateen Grizzly Sanctuary, Valhalla Wilderness Society biologist Erica Mallam and I also became involved in helping to save the Kitlope Valley on the north coast. Surveys showed it was not only the world’s largest intact temperate rainforest, but also that it’s grizzly bear population had been severely depleted by overhunting. My independent review of grizzly bear trophy kills in the Kitlope confirmed that this vast watershed was largely hunted out, which was shocking. The Haisla Band Council and Henaksula First Nation elders used my report in their negotiations with the BC government, and achieved for the Kitlope Valley the first grizzly bear no-hunt moratorium in the province – over 25 years ago. I had to ponder their keen leadership and passion on the issue, the elders’ ancestral respect for the grizzly (Sax), and the difficult public meeting we had in Kitimat with the guide/outfitter blatantly denying he was over-hunting grizzlies. Much to their credit the BC Wildlife Branch had already created a large grizzly bear no-hunting reserve in the Khutzeymateen, but it didn’t protect the reserve from logging. 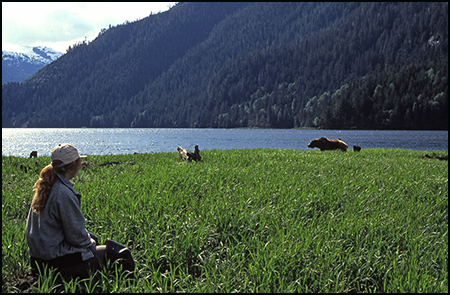 While working for full protection, I and Erica recognized that people needed to be brought to see this fantastic bear valley, so we developed the first BC coastal bear-viewing tours. We first brought in Dr. John Schoen from Alaska to advise on best practices guidelines for tour operators. 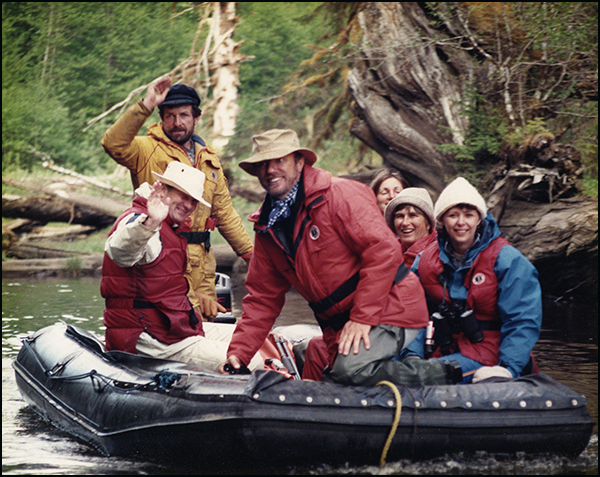 Wayne McCrory (standing, back) guiding one of the earliest grizzly bear viewing tours. His passengers became lifelong supporters of grizzly bear habitat protection. Initially our tours brought in potential funders for our campaign, and film crews such as the CBC Nature of Things, which were all key to building the publicity and support that eventually saved the area as Canada’s first Grizzly Bear Sanctuary. We used the successful low impact guidelines we developed for the Khutzeymateen as a model for bear-viewing tours necessary in raising public awareness and support for the VWS proposal for a Spirit Bear conservancy on the mid-coast. By then the prospect had arisen that bear viewing could provide sustainable income for coastal First Nations, and help save the bears from trophy hunting. Goaded by this, I became personally involved training young First Nations people as bear-viewing guides, and still continue doing so each year. 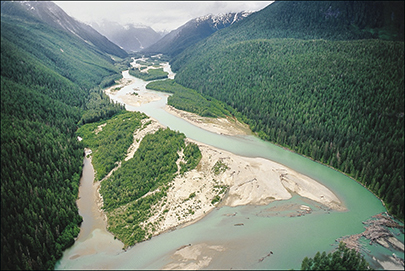 Wayne and Erica’s work for Valhalla Wilderness Society, supported by several other environmental organizations, resulted in the creation of the Khutzeymateen Provincial Park [a.k.a. Khutzeymateen/K’tzim-a-deen Grizzly Bear Sanctuary] in 1994. It was the first area in Canada to be protected specifically for grizzly bears and their habitat. It’s size was doubled by the provincial government as a result of a later planning process. Photo by Wayne McCrory. One of the worst chapters in the grizzly bear hunting controversy concerned A. Dionys de Leeuw, a Ministry of Environment, Land and Parks biologist who published a report revealing the flaws in the government’s scientific methodology for managing grizzlies. He pointed out that grizzly bears could be wiped out by 2034, and the government’s methodology would still show they were abundant. He was shockingly mistreated and lost his job for it. The government then made some minor improvements in its process, but the retribution against de Leeuw sent a message to all biologists that the government demanded conformity, not truth. Shockingly, other biologists joined in attacking him. He is one of my heroes to this day, though he has now passed on. As a biologist, I saw first-hand the pressure that hunting groups put on the government to allow high kill levels. However, I have also seen that the consistent pattern of bias towards hunting interests has been deeply entrenched in both the political and bureaucratic levels of the government, itself, that in my opinion was a blatant violation of the public trust. 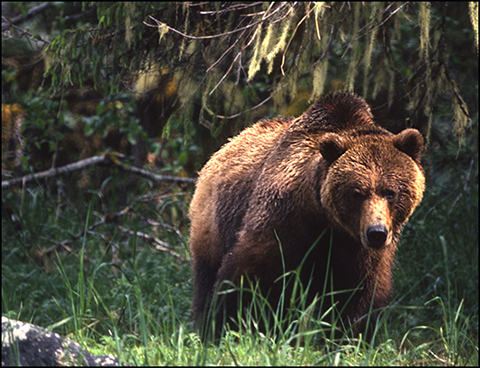 In 1987 Erica Mallam and I did an independent review with Dr. Stephen Herrero of grizzly bears and the BC parks system, and recommended all BC parks be closed to grizzly hunting to optimize the umbrella of protection of species imbedded in our park system. I still remember one of the Wildlife Branch pro-hunting biologists yelling at me over the telephone at this recommendation, which was a totally valid and reasonable one. Unfortunately grizzly hunting continued in most provincial parks. Biologist Erica Mallam assisted Wayne in grizzly bear studies and bear-viewing tours to support protection of the Khutzeymateen Grizzly Sanctuary and the Spirit Bear Conservancy. Photo by Wayne McCrory. Later we worked with England’s Environmental Investigation Agency (EIA) group, as well as Dr. Brian Horejsi, Dr. Barrie Gilbert and Dr. Paul Paquet and others to achieve a ban on the import of grizzly bear trophy parts to EU countries. Dr. Horejsi had also written a report criticizing the government’s scientific methodology, but it was simply ignored. While on the BC government’s Grizzly Bear Scientific Advisory Committee, I and a number of other bear biologists continued pushing for large grizzly bear no-hunting reserves in the different bioregions of the province. Only two of these were ever implemented—on the BC coast—while the BC Wildlife Branch dragged its heels for decades on the others. Bear Watch headed by Jan Theunisz also launched a campaign and funded scientific reviews such as an evidence-based review of the management of the grizzly bear hunt in BC. Meanwhile the Raincoast Conservation Foundation began buying out guide/outfitter grizzly bear hunting territories on the BC coast, with peer-reviewed scientific reviews of the problems associated with the grizzly hunt and constant opeds by Dr. Chris Darimont, Kyle Artelle, etc. ; combined with key research reports and outreach by Dr. Faisal Moola of the David Suzuki Foundation working out front and behind the scenes for some 12-14 years. The McAllisters, who eventually started Pacific Wild, were also a major force in grizzly bear protection, and individual activists such as Barb Murray of Bears Matter and Trish and Eric Boyum of Ocean Adventures played key roles in public information campaigns. Given the major influence that public opinion played in the ultimate decision, this work was of key importance. They all have their stories, their exhaustion, their despair to tell about. Meanwhile, bear-viewing had taken off amongst both native and non-native tour operators; the fact that today it brings in far more income to BC than trophy hunting was, I suspect, an important factor in the government’s recent ban of all grizzly bear hunting except for First Nations traditional use. There are now over 50 bear-viewing tour operations on the BC coast, quite a number of them First Nations or employing First Nations guides or staff at lodges or tour boats and including First Nations cultural/heritage values. The end of trophy hunting in these areas will enhance the quality of bear viewing and the visitor experience for tourism businesses. In the year preceding the government’s decision, on behalf of VWS and also as an independent bear biologist I made a major submission to the recent BC Auditor General’s grizzly bear review. Besides noting that the province has not been taking care of habitat, the Auditor General’s report raised serious questions whether the grizzly bear hunt was sustainable. The BC government’s decision to end trophy hunting is a momentous milestone. While I regret their failure to acknowledge that grizzly bears face serious risks to their long-term survival, nevertheless, at least they stepped out of the conventional pro-hunting mindset enough to recognize that the vast majority of the public wanted an end to it for both ethical and scientific reasons, and even to recognize the far superior economic return of grizzly bear viewing. I hope that will be just the beginning of the changes we need. VWS wishes to thank the numerous First Nations & their elders, conservation groups, and hundreds of VWS supporters, as well as the many biologists who, over the previous 30 years or more, continued to expose the mismanagement and unsustainability of the BC grizzly hunt. This includes the late government biologist A. Dionys de Leeuw, Dr. Barrie Gilbert, Dr. Lance Craighead, Dr. Brian Horejsi, Dr. Paul Paquet, Erica Mallam, Dr. Faisal Moola and biologists with the Raincoast Conservation Foundation.